…A day trip to London. We must have been on about 20 of them by now, but I don’t really mind. station where I bought two tricks, neither of which I have yet been able to do. My dad must have needed to go to London on work business, and then decided to bring the family along for a day trip as well. I haven’t a clue why we went to a magic shop. One of the tricks was something to do with making a ball disappear from under a cup. I never quite mastered it. I know full well why we went to the BBC shop, however, and it was because I demanded it. I think this was the occasion I bought SIX O’CLOCK NEWS and NINE O’CLOCK NEWS car stickers, which I then pretentiously displayed in the back window of the family Volkswagen. “Ooh, does your dad work for the BBC?” people would ask at school from time to time. Stupidly, I never once pretended and said yes. We’d just returned from another visit to London, and I was clearly inspired by the publicity I’d seen for the newly-opened (although not yet operational) network. What on earth has that woman behind the Queen got on her head? Anyway, it’d be years before I’d actually get to ride on one of the trains, and when I did I naturally made sure to sit right at the front, loving the novelty (as I still do) of there being no driver. 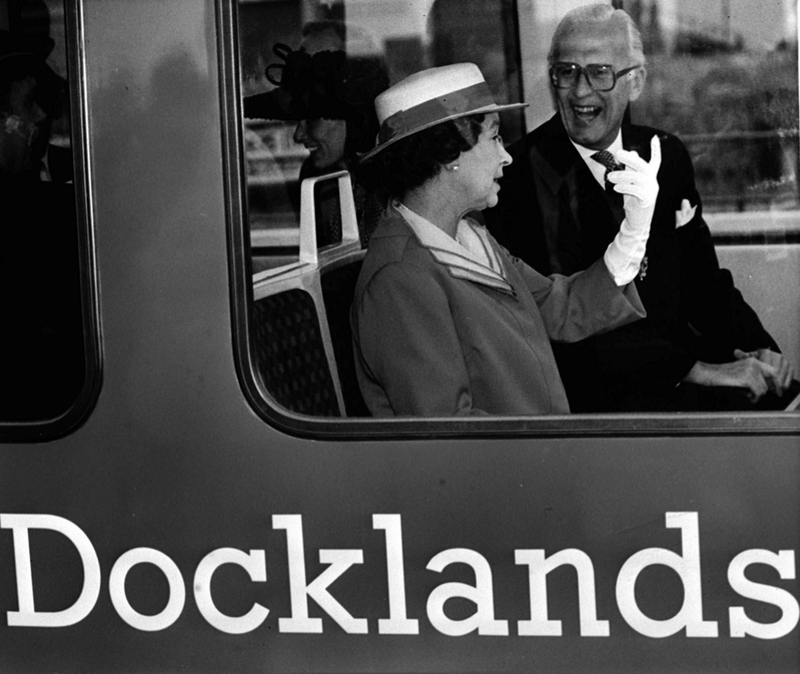 The DLR’s grown a lot since then, but in the right way. And every time I use it I fall in love with it all over again. The way it threads in, out, over and under the most astonishing extremes of wealth and poverty, and the very old and the ultra-new, makes it the most beguiling way to get a condensed visual summary of the whole of London. Plus you can pretend that you’re in charge of the controls. Come on: I know I’m not the only one. …My 14th visit to London. We got on a train at 10.09 after 10 minutes of waiting. It was completely full so we all had to sit in separate seats all around the carriage. walking on an Underground train, swaying from side to side. It didn’t help that the coffee cups had no lids on. We arrived at London St Pancras at about 12ish. where we watched Prime Minister’s Question Time. I’m not sure if we’d arranged to watch prime minister’s questions before the trip, or whether we queued up outside parliament in the hope of being let in. This was back when you could actually see right into the chamber, before the big perspex barriers were put up to stop demonstrators throwing stuff thereby subtracting all credibility from their campaign and undermining their own cause. I do remember one fusty old Tory clambering to his feet and urging the prime minister that, seeing as it was St George’s Day, she should hold an impromptu debate on how great England is under a Conservative government. How the Commons roared with that kind of laughter you don’t hear ANYWHERE ELSE in the country. went to London for the day. As usual we couldn’t find seats on the train till we got to Leicester. We went to Covent Garden where I froze to death. go to do question time in parliament. As well we went to Trafalgar Square, HMV and Selfridges for a drink. We all got terribly tired. There’s no explanation why this trip took place on a weekday rather than at the weekend. I’m very surprised I was allowed a day off school. I’m even more surprised my parents countenanced asking for one. Perhaps they’d got hold of some kind of special offer on train tickets. 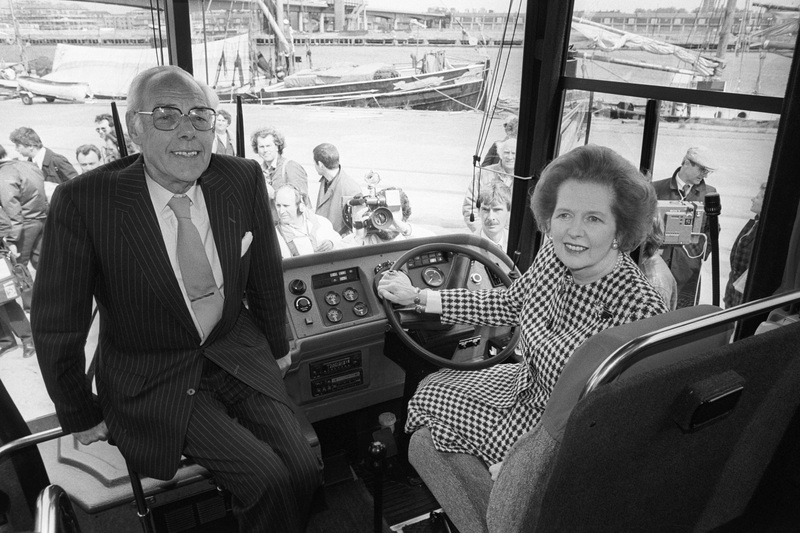 Perhaps it was conceived as a kind of early Christmas present, albeit one that involved a stolen glimpse of Mrs Thatcher through a car window. 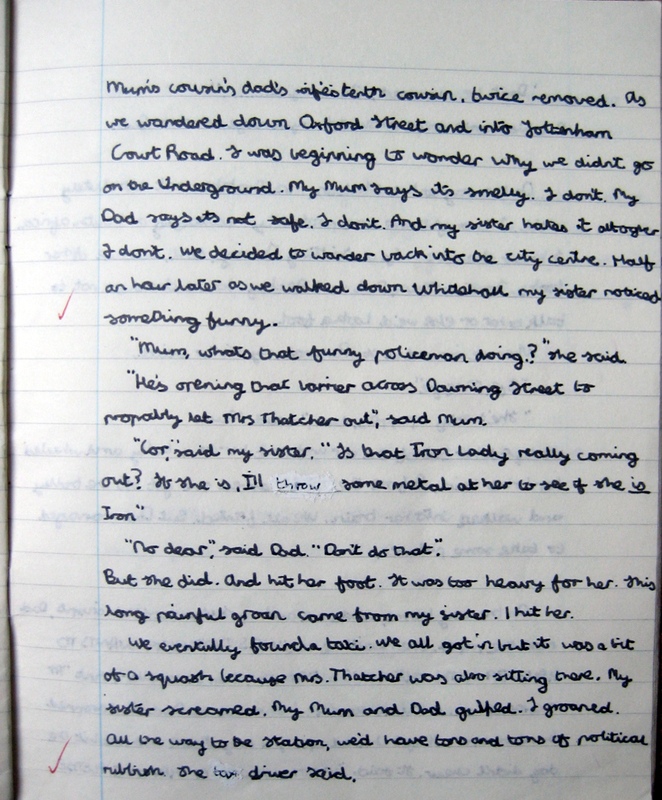 …We copied our stories into our English books. It was Games today and we did hockey again. Star Trek was on today. My story was called A Mrs Thatcher Nightmare. I’m not going to make a habit of this, but below you’ll find the text in full. I realise this is a self-indulgent thing to do, but then so is this entire blog. 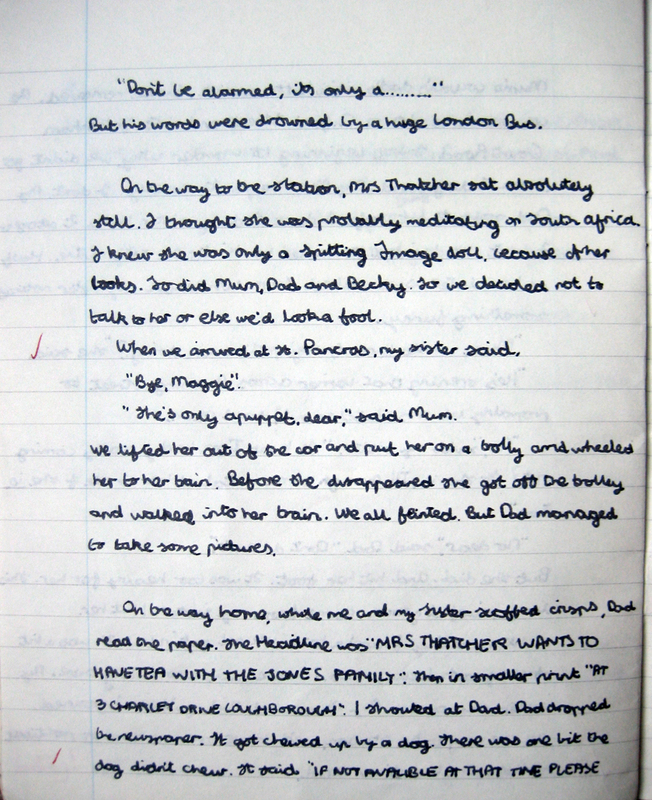 If you’re not keen on browsing extended reams of childhood scrawl, there’ll be another update along shortly in which I talk about Doctor Who, and one on 23 September where I get told off in class.